Just as in yesterday’s puzzle, lots of zippy fill here: RAGE-QUIT and SICK JOKE, MCDREAMY (I don’t watch Grey’s Anatomy but I thoroughly enjoyed the recap of the “McDreamy dies” episode), RICO ACT (anyone else slow themselves down by trying RIOT ACT here? ), NBC NEWS, PONY CAR, PGA TOUR, KIA SOUL, HOT WAX ([Brazilian supply], factual clue), ST. CROIX, AMEX CARD, and TAX CUTS. 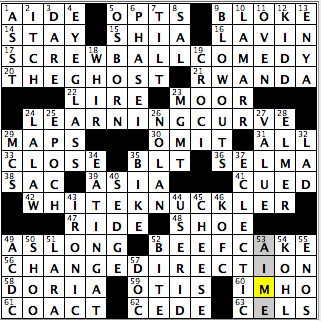 Usually I’m bored by the fill in a grid like this, with all sorts of dry 7-letter inflected words. Kudos to Tim for packing in so much lively material. I struggled in the northwest corner, and not just because of the RIOT ACT misstep. Despite having fished for bluegills as a little girl, despite hearing my dad speak of crappies (say it “croppies”), I did not know you’d call either of them PANFISH. And “ace” can mean so many different things; 1d. [What an ace is rarely seen on] clues a PAR FIVE golf hole but I wasn’t thinking of golf. And I went for I DO instead of VOW, which also mucked things up here. I was surprised my solving time wasn’t longer, given how long much of this corner was empty. Clunky fill IPSA, -INE, HIT AT, FOTOS. EASY ONE feels contrived, and has too much of an echo of EAZY-E. I am guessing Eazy-E chose that name without picking an etymology that’s independent of “easy.” However! The late EAZY-E is of the moment, as there’s an N.W.A. biopic coming out in August; the movie brings us a new OSHEA clue, too, as Ice Cube’s son and namesake, O’Shea Jackson Jr., plays him in the movie. 1A [Part of “America’s New Year Celebration”] ROSE PARADE – I could pass on the Rose Parade. Would much rather watch games involving a 8 or 16 team playoff! 15A [Moscow stage premiere of 1899] UNCLE VANYA – Probably one of the only Russian plays I know! 23A [Place abutting Pennsylvania Railroad] ST JAMES – How’s your Monopoly knowledge? 30A [Colleague who said Jim “raised puppeteering to an art form”] SHARI – No doubt referring to Shari Lewis, creator of Lamb Chop. I wrote in FRANK, thinking that this was referring to Jim Henson’s longtime colleague Frank Oz. 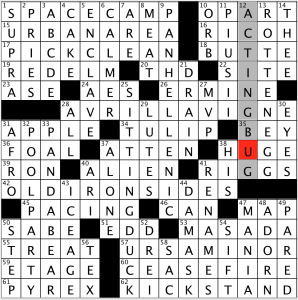 39A [Puts riders on] AMENDS – Nice tricky clue. This one stumped me at first. 42A [Legendary galley] ARGO – For some reason, I put in NINA. The Nina is kind of legendary, isn’t it? 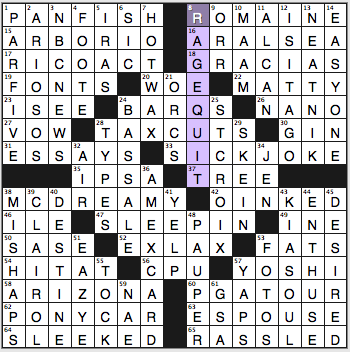 63A [No nail-biter] SNOOZEFEST – Great clue/entry! 12D [Amy Adams role of 2013] LOIS LANE – She starred in Man of Steel with Henry Cavill. She will be in the sequel, Batman v Superman: Dawn of Justice coming out next year. I told you I was a comic book fan! 25D [Literally, “gentle way] JUDO – I was thinking JETE, as in the ballet jump. Learned something new! 33D [Not below] ON DECK – Crosses CRUISES, which in a way is a mean joke! Another great clue! 35D [1993 CBS debut] LATE SHOW – Another wrong entry for me. I put in CSI MIAMI. That show didn’t debut until 2002. David Letterman recently retired; Stephen Colbert will take the helm this September. 36D [It’s sung 18 times in “A Wonderful Guy”] I’M IN LOVE – This song is from South Pacific. Yes, I looked it up; no, I have never seen it! Awesome puzzle. Feeling good since it didn’t take me an hour. Will no doubt be re-humbled next week! 4 stars! 1A [NASA program for aspiring explorers] SPACE CAMP – This actually exists? I don’t think I know anyone who has been to one of these. Maybe because I don’t live near Cape Canaveral…? 16A [Nikon competitor] RICOH – For Nikon, I think cameras. For Ricoh, I think copiers. They evidently DO make cameras, but it seems as they are hardly a “competitor” of Nikon. 28A [Singer with the 2002 debut hit “Complicated”] AVRIL LAVIGNE – Should have got this straight out, but I had a brain cramp. I think she’s married to the lead singer of Nickelback. 35A [Ottoman bigwig] BEY – OK, maybe one other snarky entry. Again, this one is rare and is not a pain. At least it helps get a B into the puzzle! 50A [“¿Quién ___?”] SABE – Means roughly “who knows?” Often this is clued as Kemo ___, but I like the challenge from this one. Something different. 3D [Tot’s song starter] ABCDE – I’ve seen ABC, and even ABCD, clued this way. Don’t know if I have ever seen the first five letters of the alphabet. Any five letter alphabet string can be a fair entry, but it also is rare. Nicely done. 9D [Like the ancient Olympic Games] PANHELLENIC – Simply means relating to Greece. Nice word. 11D [15th-century pope] PIUS II – You know when the answer is a Pope’s name, you’re likely in for Roman numerals. The only question is which Roman numeral! Pius II? IV? IX? The crossings will determine it, but a nice way to add challenge to a puzzle. 25D [One who’s easy to take] SITTING DUCK – Again, well done. Great entry. 40D [Name from the Hebrew for “lion”] ARI – Nice clue. I believe the Arizona Diamondbacks use ARI as an abbreviation in their box scores and the like, but I feel like I learned something when I solved this clue! 44D [Table linen fabric] DAMASK – A word I know primarily from puzzles, but a great entry. The patterns look more like gaudy wallpaper. Textiles are NOT my strong suit! Great puzzle. Decent time for me on this one, so maybe not as hard? We will see how next Saturday’s LAT puzzle goes. 4 stars for this one. Good day, everyone! I hope you’re enjoying your weekend so far. 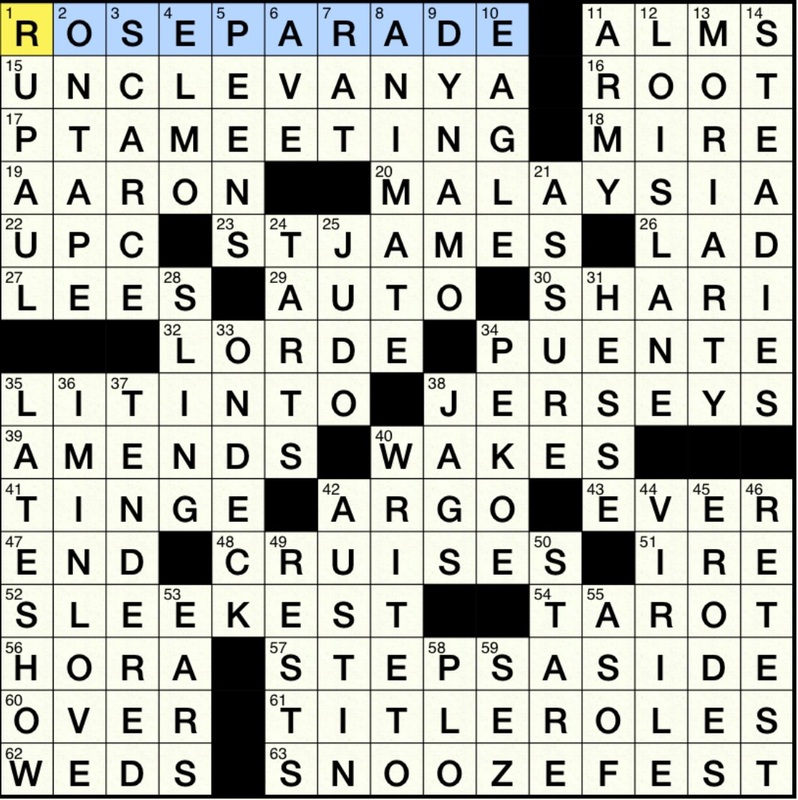 Today’s crossword, brought to us by Mr. Randolph Ross, involves taking us out to the baseball game and seeing some pitchers throw their best stuff. Or, it’s four theme answers in which one of the words in each entry is also the name of a type of pitch thrown in a baseball game . WHITE KNUCKLER (42A: [Rough airplane trip, e.g.]) – Most people who throw knuckleballs usually don’t have their knuckles on the ball as much as they have their fingernails on it. CHANGE DIRECTION (56A: [Go another way]) – Change is the shortened version for a change-up. Despite the sports theme, took a little while longer to get really going with this grid the past few. 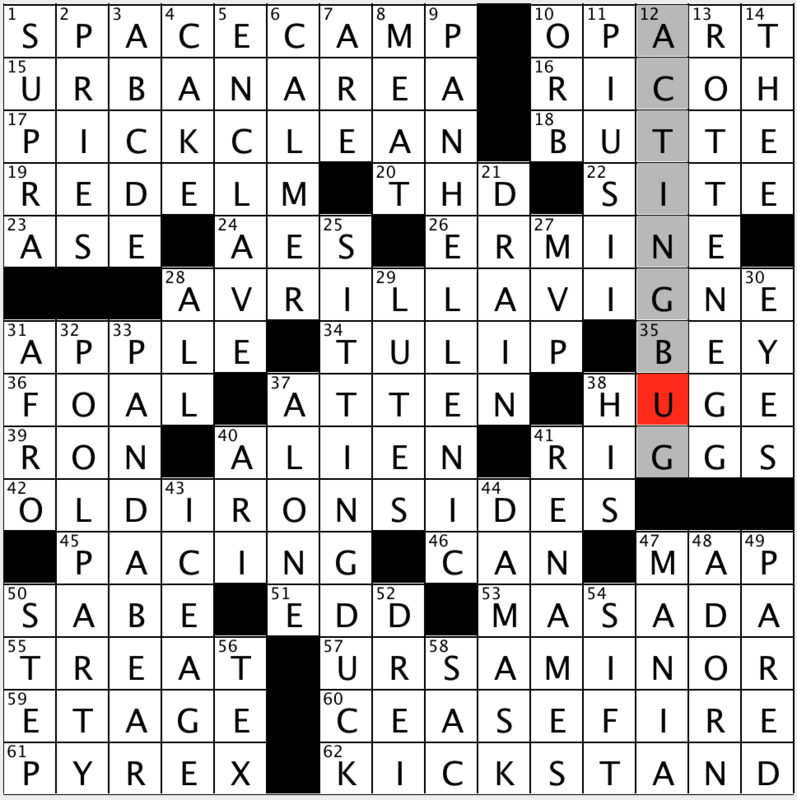 Did the word “photos” need to be in the clue for BEEFCAKE (52A: [Mr. Universe photos, e.g.])? Probably would have been just fine with “Mr. Universe, e.g.,” or “Ade, while on the beach, e.g.” Again, any grid is a winner with me if it involves African geography, so pretty nice for me to see RWANDA today (21A: [Where Dian Fossey did her work]). It’s always a little jarring to see a letter be used as a Roman numeral in a grid when the clue doesn’t specifically or misleadingly require you to put in a Roman numeral, as was the case with PHASE I (6D: [Beginning of a new project]). But once you see the ‘phase’ part, it’s pretty much a done deal that a Roman numeral was coming immediately afterward. We’ve had a run of seeing LA LAW a good number of times in recent puzzles, and today’s no exception (24D: [Show featuring Jimmy Smits and Susan Dey]). Can Corbin Bernsen get some love when mentioning L.A. Law in a clue sometime soon? “Sports will make you smarter” moment of the day: LAVIN (16A: [Linda who starred in “Alice”]) – College basketball head coach Steve LAVIN was, as of three months ago, the current head coach of St. John’s University in New York (Queens). Before that, he was the head coach at UCLA, and was named head coach right before the 1996 season, when they started their defense of the 1995 NCAA Championship. Lavin took UCLA to five Sweet 16 appearances, but never took the Bruins to the Final Four, which led to his ouster in 2003. Lavin, while head coach of St. John’s, underwent surgery for prostate cancer in 2011. After taking St. John’s to two NCAA Tournament appearances – but no victories in the Big Dance – Lavin and St. John’s decided to part ways this past March. See you all for the Sunday Challenge! This entry was posted in Daily Puzzles and tagged Daniel Nierenberg, Doug Peterson, Randolph Ross, Tim Croce. Bookmark the permalink. NYT: boy this one did not go down EAZY or EASY… Some things I plain didn’t know (PANFISH- PAR FIVE) and others were clued in confusing ways. I can see it has interesting content after the fact. So the fault is mine. Each quadrant did have something that came relatively easily (e.g ARBORIO, CLAIROL) but it still required a lot of work to finish. I did learn something new, though, which I really like: RAGE QUIT! Now, I’m au courant, in this minute way. An example of cluing that threw me is the clue for RASSLED (fought agin). I understand that the Agin in the clue is meant to tell me it’s a slang version of a word. But there’s nothing in the meaning of RASSLE that says it has to be a repeat fight. It popped into my mind at one point and I dismissed it on those grounds. Here, “agin” is rural dialect for “against,” so it’s not a repeat fight. Oh, I see! Against not Again! Thank you. Glad I grumbled and learned something! “Usually I’m bored by the fill in a grid like this, with all sorts of dry….” Funny, ’cause that’s how I found this puzzle: dry. Found the LAT times a bit tougher and more enjoyable. Was finally able to recall STJAMES which allowed the NW of The Stumper to fall. Can’t say I enjoyed it much. RAGEQUIT was amazing, actually that whole central region was pretty sweet! Horton Foote. When I had the FO in place, even though I know the name, I couldn’t think of it. 6:36 is a fairly standard Saturday NYT time for me, but it honestly felt like more of a Stumperesque struggle and I was surprised not to see at least 8 or 9 minutes on the clock. Or maybe it’s Shelby Foote. Horton wrote movies, Shelby wrote about the Civil War. Don’t recall what the clue was. The “p” in the NW corner was the last letter for me. One across (panfish) was unfamiliar, and “sunfish” would also have been an ichthyologically, if not cruciverbally, correct answer. Tough corner! 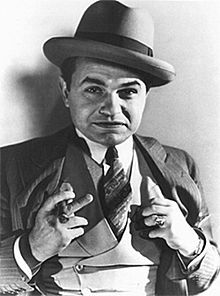 RICO is a 1970 law, sez wiki, so I don’t see how it could have been used against Capone. I vaguely recall seeing something from the ’70s (part of a Mad satire piece?) where EG Robinson as Little Caesar (Caesar Enrico “Rico” Bandello) falls to his knees and wails something like “Mother of Mercy, what will become of RICO” after he’s busted for racketeering. LAT – SPACE CAMP is in Huntsville. What I learned from doing Tim Croce’s puzzle this morning: “Garner, for short” has two possible answers for J _ _, and which one you enter first is probably a good clue to how old you are. DNF for me. NE corner easy, middle and SE not so bad, SW a bit tougher, then NW impossible. At various times I had IDO for VOW, RIOTACT for RICOACT, FOSSE for FOOTE (I googled him in desperation), but even with those correct I couldn’t get the rest. SomethingFISH for sure, but PANFISH? That means nothing to me. Didn’t know ARBORIO. And so on. Nothing wrong with the puzzle, just a bunch of stuff I didn’t know and couldn’t guess. Oh, two more things: “Mustang, e.g.” seems like a bad clue for PONYCAR — a Mustang is a pony car, isn’t it? There aren’t any others that have the same nickname, or do I have that wrong. And I don’t understand HITAT for “try to swipe”… anyone care to explain? HITAT and NIPAT are two of the most tortured verb+AT combos we see in crosswords. “Jack Frost nipping at your nose” is in the language, but I don’t know that anyone says a puppy “nips at” them. And HIT AT, don’t know who on earth actually says that. “Swing at” or “take a swing at” or “throw a punch at,” sure. Not HIT AT. And on top of that — see comments below — the connection to ‘swipe’ is strained. Agree on HIT AT – have never said it, nor heard anyone say it. Disagree on NIP AT – I’ve said that a puppy “nipped at” me. And of course, there’s the pleasure of someone nipping at your heels. Although I don’t like HIT AT, I’m okay with “swipe” used in that sense. I think “take/took a swipe at” is reasonably in the language. Sometimes it’s a physical swipe, other times it’s a verbal swipe. SPACE CAMP indeed still exists. It’s in Huntsville, AL. At least there is one site there, not sure if there are others. I went when I was in 6th grade (over 20 years ago). One of my Facebook friends is there right now with his son. It was, and certainly still is, an awesome experience. I guess I got lucky in the northwest part of the NYT. Although I’m not a fisherman, I’m familiar with PAN FISH. That and NBCNEWS were my first two entries, so I was able to avoid RIotACT and I do at 27-A. My problem was in the southwest. Haven’t seen Grey’s Anatomy, so I went with Dr. DREAMY, which seemed plausible, so I couldn’t see MISHAPS and CLAIROL for the longest time. Animalheart, I don’t think RICO got Al Capone – it was enacted in 1970. I also found that clue confusing. I googled the definition of swipe, and the first definition is “hit.” It’s not how I use the word (to me, it means steal), but it seems like a valid clue. I’ve never heard the word swipe to mean hit somebody, so I understand your confusion. Thanks. I thought maybe it was some modern lingo with some connection to people swiping their smartphones, but then it couldn’t have any connection to literal hitting (I hope). I take back my comment. I agree, it’s rare, but if someone said to me that another person “took a swipe” at her, I’d assume he hit her, or perhaps tried to. I’d assume the latter rather than the former. Maybe it’s just out of the language now? As in sideswipe. Not really in common usage as a stand-alone. I thought that this puzzle was tough, especially the NW. Only the NE was easy for me. I used to catch “sunnies” and perch when I was young. Are sunnies and crappies the same? I have always thought so. Anyway, a panfish is an edible fish that can fit in a pan. I knew that, but I was a little bit put off because while my father let us eat perch (delicious), he refused to let us eat sunnies because he considered them to be too bony and essentially inedible. I think we had a discussion a few months ago about a “condor,” a hole-in-0ne on a par five, something I had never heard of before that day. Fun puzzle in any event. Oops, should’ve checked that. Thanks for the corrections re: RICO! re PANHELLENIC — the prefix “pan” is an inclusive prefix like “all”, because ancient Greece was not unified but composed of various independent, rival city-states. We see it today in PanAmerican Games, and in an airline meant to service the Americas, North and South and Central. I intended to add that Pantheon was a temple dedicated to all the gods, as opposed to a temple honoring only one god. I am all the nonicas, I am legion. LAT – Is 14d an Old Testament pronoun or a Middle English pronoun? Loved the LAT!! Had a problem with “hog support” until it dawned on me. Doh! Kickstand! !